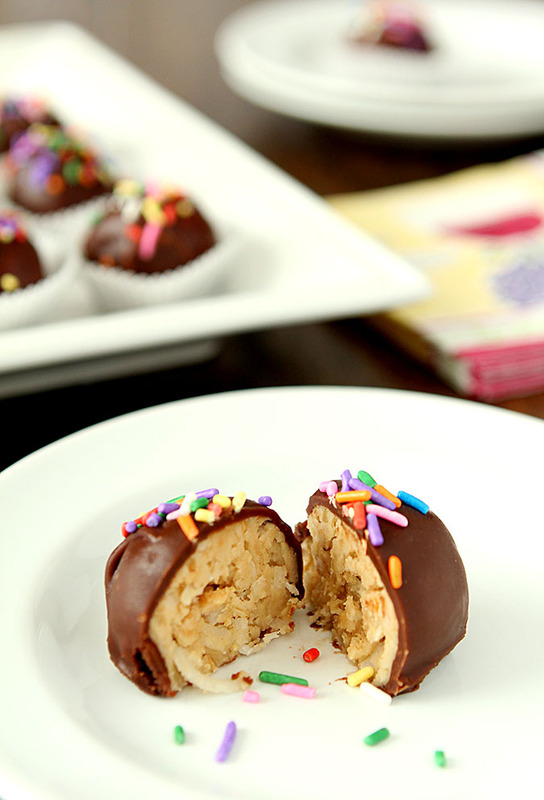 These Milk Chocolate Covered Peanut Butter and Coconut Balls are absolutely decadent. I know I can’t help myself and I bet you can’t eat just one either! I happened upon this recipe in the most unlikely place. My own blog. Yes…I did a search for something else with chocolate and peanut butter and voila; this recipe was included in the search results. I knew as soon as I saw it listed that it needed updating because there was no photo in the archive listing. Now that could be a glitch because of a theme change several months ago that I’m still working through with over 800 posts but something told me no; that wasn’t it. 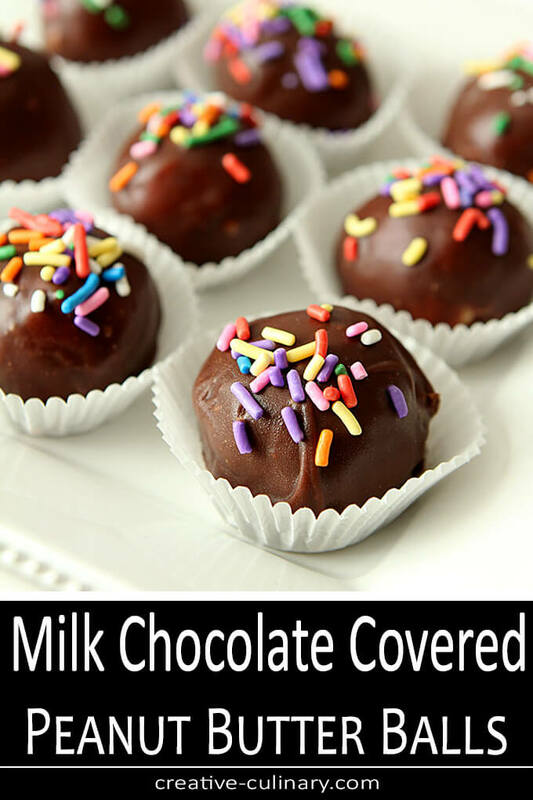 I just didn’t remember making these Milk Chocolate Covered Peanut Butter and Coconut Balls for the blog anytime recently. I was SO right…the date was 2004 and the post was pretty simple. No photo, no story, just a recipe. I have more of those I’m sure from ‘back in the olden days’ and hopefully one day I will have discovered each one, made the recipe anew and posted the final product in all it’s photographic glory. As luck would have it I had just noticed a bag of coconut in the pantry that I needed to put a ‘use it or lose it’ tag on. You know what I’m talking about. Some things are better fresh, fine after a bit and totally wrong if they’re kept too long. I didn’t want to get to the totally wrong space so I knew I needed to focus on coconut and son of a gun…here was my chance! Quite honestly I figured I would make these totally yummy treats and save the work to publish the recipe over the Christmas holidays; that’s the time so many people thing of making treats like this. But I had just answered the door to two of the neighbor kids, Mason and Nolan who were returning something I had loaned their dad, and they came in to visit a bit while here. They saw my work in progress and asked if they could help. Sure…why not right? While perusing the two boxes that I have filled to the brim with every sprinkle and sugar color available I told the boys we needed to think Christmas. What I heard? ‘But why Barb, we love these now!’ Eye opening. Seriously ‘But Why?’ is so true. Why on earth do we relegate something so tasty to just a holiday season? Never again. 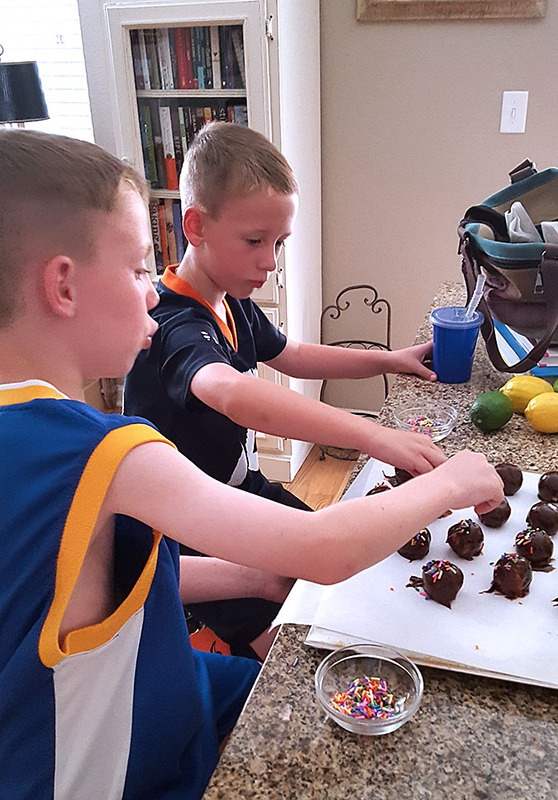 As a result we settled on some beautiful multi-colored sprinkles and while I did the dipping, the boys did the sprinkling and we had quite the process going on and the work was finished quickly. Of course I promised that they could take some home and I was told that their mom said they had to come home with 8 of them. OK…but well, mom did not know what we were doing so that arbitrary number seemed just a bit suspicious. Plus there are 6 in their family and 8 was wrong so we settled on 9 which would be one and a half per person; once cooled on the outside enough to harden a bit the boys headed off to home. I guess they just could not wait. I talked to mom later and that plate showed up with only seven treats…I know they were just trying to do a service to their family and do some quality control…can you blame them. Do you like Reese’s Peanut Butter Cups? Well, all I can say is this – these are MUCH better and yes, a great cool treat on a hot summer’s day too. Make them, you’ll see! Mix together peanut butter, coconut, oats, powdered sugar, butter and vanilla. Shape into balls. Chill for 2 hours. In top of double boiler, melt together butter and chocolate chips. Turn to very low heat while dipping. (This can be melted in the microwave as well. Go slow on very low setting, stirring occasionally). 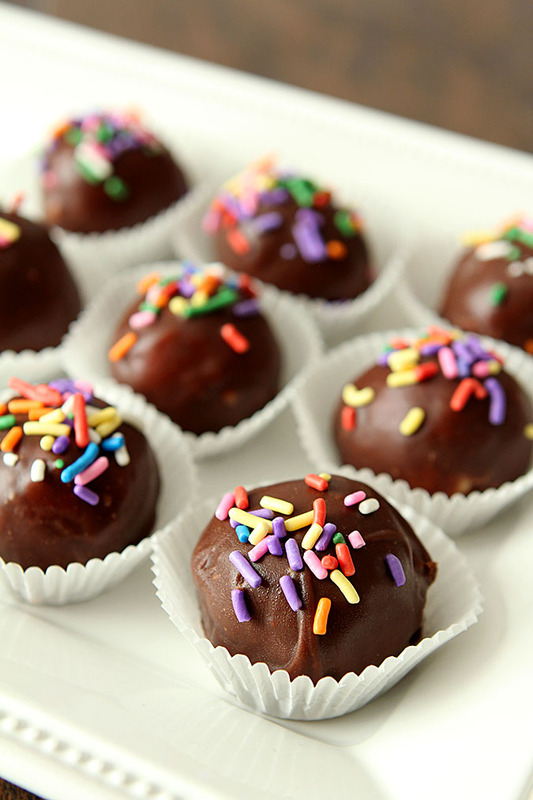 Dip peanut butter balls into melted chocolate. 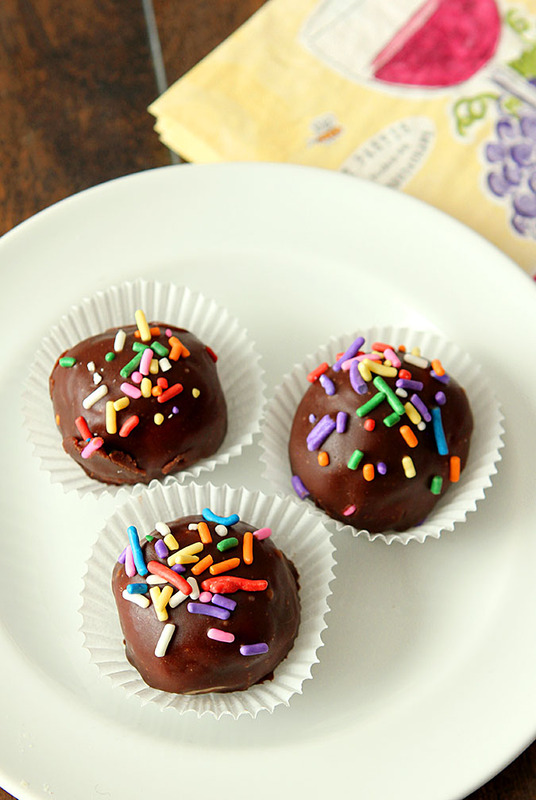 Place on waxed paper and garnish with sprinkles. Refrigerate until coating hardens. Store in refrigerator or freezer. Chocolate and peanut butter? Yes, please. And coconut? You’ve got my number! This looks terrific — glad you brought this one back. Thanks! This recipe and too many others were transferred from my HTML site and sadly languish in the obscurity of the first couple of years of this century- think this one was 2003! Not all are worthy of getting their real moment in the sun…but this one does, they are decadent!